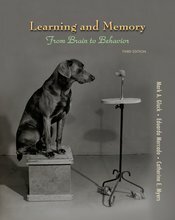 With its modular organization, consistent chapter structure, and contemporary perspective, this groundbreaking survey is ideal for courses on learning and memory, and is easily adaptable to courses that focus on either learning or memory. Instructors can assign the chapters they want from four distinctive modules (introduction, learning, memory, and integrative topics), with each chapter addressing behavioral processes, then the underlying neuroscience, then relevant clinical perspectives. The book is further distinguished by its full-color presentation and coverage that includes comparisons between studies of human and nonhuman brains. The new edition offers enhanced pedagogy and more coverage of animal learning. Students rated the reading very highly and felt the information was very clearly written and engaging.